For many women, physically preparing themselves for a wedding is just as important as choosing a dress or settling on a catering menu, and that often means growing hair longer for their dream wedding hairstyle. 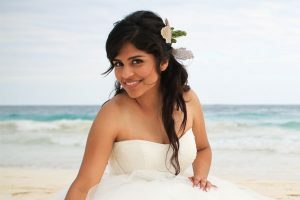 Long hair gives lots of styling options, especially for those brides who want to look romantic on their wedding day. 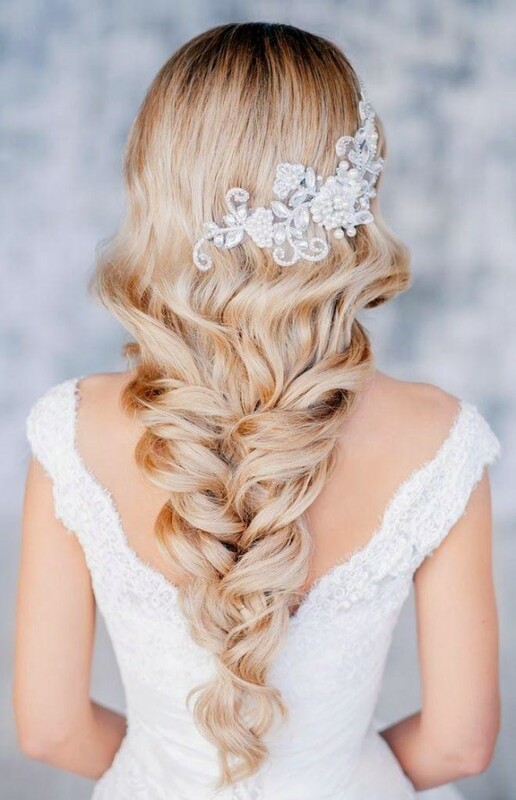 From braided styles, to updos, to long flowing hair with minimal styling, we’ve collected 30 wedding hairstyles for long hair that will make your bridal vision a reality. 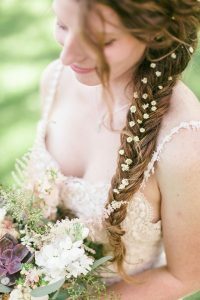 A simple style for hair that’s naturally long and thick or had extensions added, this simple fishtail braid is given an extra dash of garden style romance with tiny flowers placed throughout the braid. Depending on your bouquet, this style can take on a wide variety of textures and colors, making it perfectly customizable to your wedding. 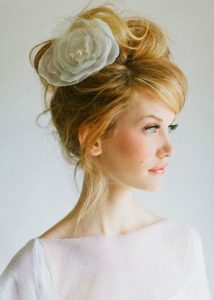 This high bun is a simple, sophisticated option for long haired brides who want hair up and out of the way. To prevent hair from looking like it’s been harshly pulled back, fine tendrils of baby hair are left loose around the face. For the rustic bride with a subscription to Vogue, this style manages to be simultaneously unkempt and chic. 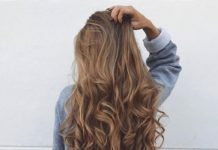 Long hair is placed in lots of loose curls that are allowed to frizz out in places, while a stray braid (or more if you’d like) gives contrasting texture. 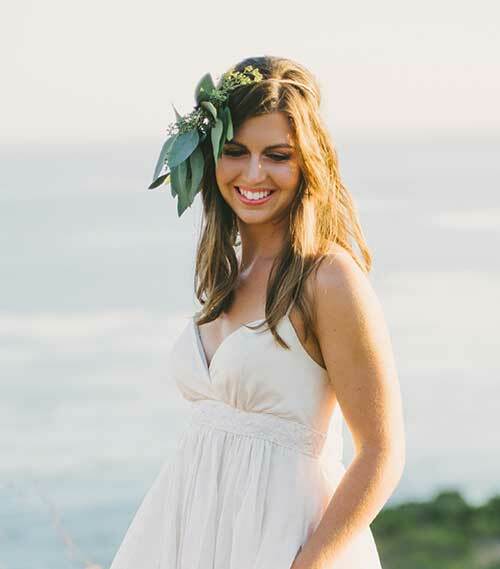 Top it all off with a minimalist forest crown, and you’re ready for your late summer wedding. 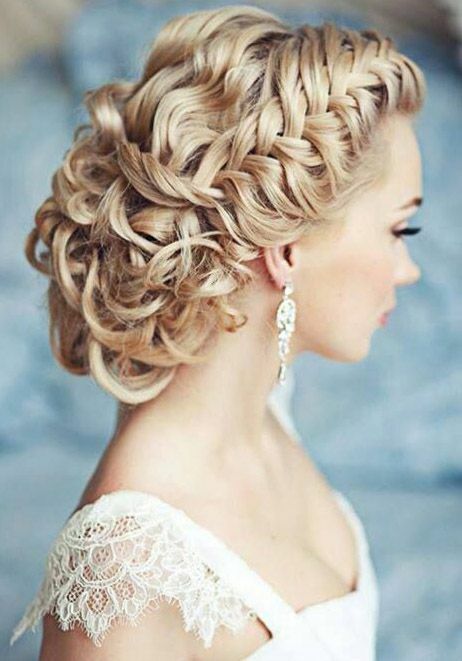 These big curls are left loose and natural for a wedding day style that’s glamorous and bold. 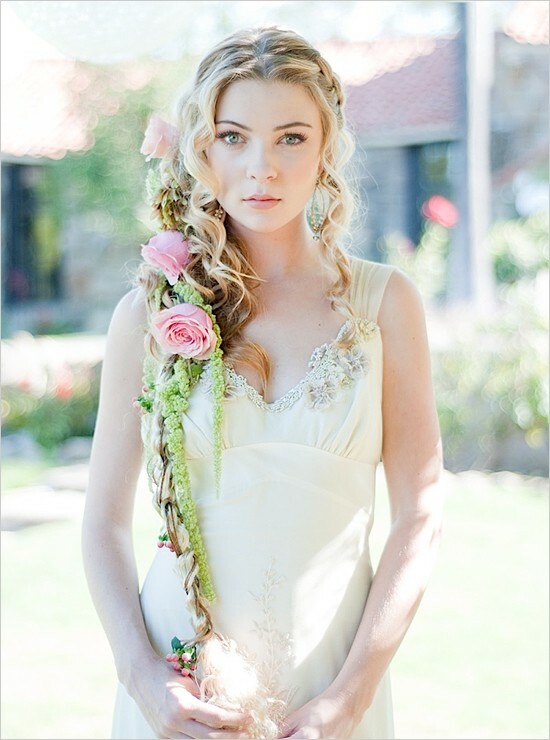 This side gathered style features several messy braids and loose hair, all pinned up with an antique gold hair brooch. With hair left hanging down to one side, this is a style that makes adding clip-in extensions easy and invisible. An interesting combination of glamour and whimsy, this look works at a simple outdoor ceremony or a fancy soiree with signature cocktails. Want your hands free while you’re walking down the aisle? 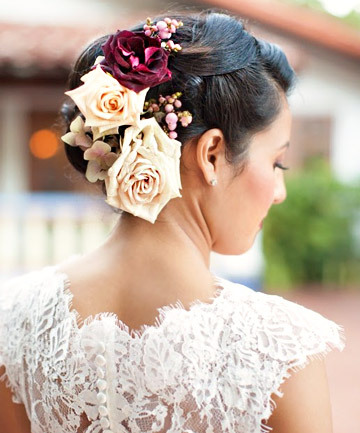 Instead of holding on to a bouquet, it can be part of your wedding day hairstyle. 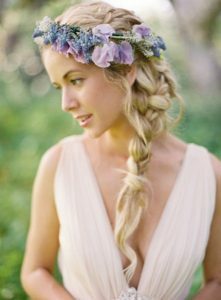 This long hair is curled and partially braided to one side, where cascading florals are pinned to the hair. In this particular style, extensions are added to make hair fairytale long, but they aren’t a requirement for achieving the romantic essence of this style. 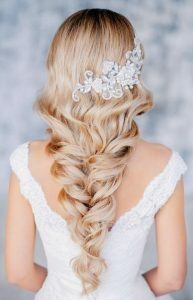 More interesting than a single braid, this wedding style actually features several braids that are intertwined together on one side of the head. 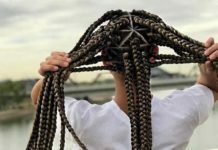 You can get this look using a variety of braid combinations, since the key aspect is the wild, twisted nature of the style. The lower half of these long strands are curled, while hair is given a huge boost of volume at the roots. If you don’t have hair that can stand up this tall all day and night, consider adding a hair piece like a Bump It that provides structure and volume that won’t fall flat. 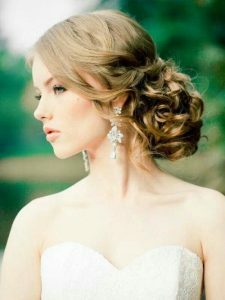 If you’re looking for a show stopping hairstyle that will leave your guests speechless, try this intricate updo. 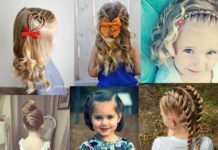 Long hair is curled all over to give hair volume and texture, and a high french braid leads hair to a low, wide bun made up of curls that are pinned to the back of the head. Not recommended to try on your own, this style will require lots of product and several pairs of professionally trained hands to get your long hair pinned securely. This simple look will keep you looking effortlessly beautiful, while remaining a practical choice for a seaside wedding that’s likely to get at least a little breezy. Accessorize with a white or cream colored flower to complete this clean, breezy style. This breezy style was made for outdoor weddings, and lets the bold hairpiece steal the show while the rest of hair is softly curled in a relaxed style. Be as playful as you’d like with the hairpiece: consider using ferns for a tropical destination wedding or ivy for an autumn affair. 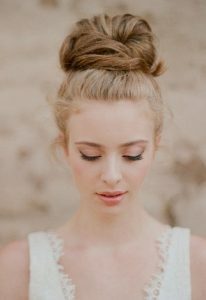 If you want to show off your strapless gown but still have your hair be a focal point of your look, try this big low bun with some loose face framing curls. This style features long hair that’s got big volume all over, while a thin french braid gathers hair behind one ear. A somewhat subdued take on a traditional Mexican hairstyle that usually features very bright flowers in the hair, we still see a variety of floral elements represented in this twisted hairstyle. The ultimate in sophistication, Kate Middleton’s wedding day hair was a stunning feat of polished perfection. With long hair in ringlet curls, the veiled tiara adds regal charm even if you aren’t marrying into a royal family. For countryside nuptials with vows delivered lakeside, this simple side braid is the perfect choice for a bride with a rural heart, whether or not she’s wearing cowboy boots under her dress. This interesting hairstyle mimics the shape of a ponytail without actually tying hair together. 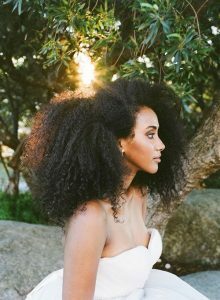 Hair in big spiral curls is pinned at the centre of the back of the head, but then let loose to fall like the ends of a ponytail would. The unique result is hair that’s pulled away from the face while still taking advantage of long, romantic waves. Unlike the modern headband style that sits farther back on the head, this thick, antique style band runs right across the forehead. Made of a netted material with a brocade pattern of crystal jewelry to one side, this headpiece gives a vintage 1920s feel to long hair that’s quite simply styled in long cascading curls. Perfect for a bride who wants flapper style without the short haircut. 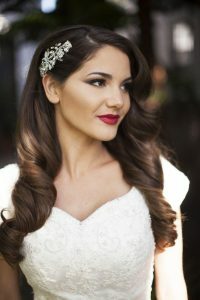 Loose and flirty, this vintage feel updo doesn’t take itself too seriously, and is perfect for a bride who mixes modern attitude with retro style. One of the best things about this look is the messy quality that means a missing pin or fallen tendril won’t spell tragedy for your wedding day style. This combination of dark hair and red roses makes for a style that’s both romantic and gothic, and perfectly suited to a cathedral wedding in autumn or winter. 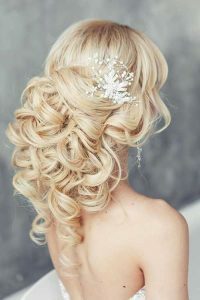 This uncomplicated hairstyle is perfect for brides who don’t want to look like a different person on their wedding day, or those who don’t want a fancy updo distracting from their jaw dropping dress. 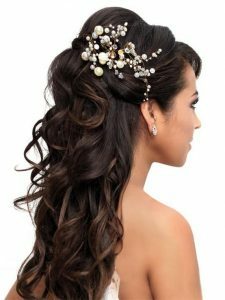 This style sees long hair left mostly loose, while still being swept back from the forehead and pinned behind one ear with a hair brooch. If you can find identical pieces of jewelry — try converting a pair of vintage earrings — you can pin especially thick hair on either side of the head. This long, wavy hair has been loosely arranged in a pattern similar to a fishtail braid, with waves gently pinned to one another instead of being tightly braided and secured at the end. 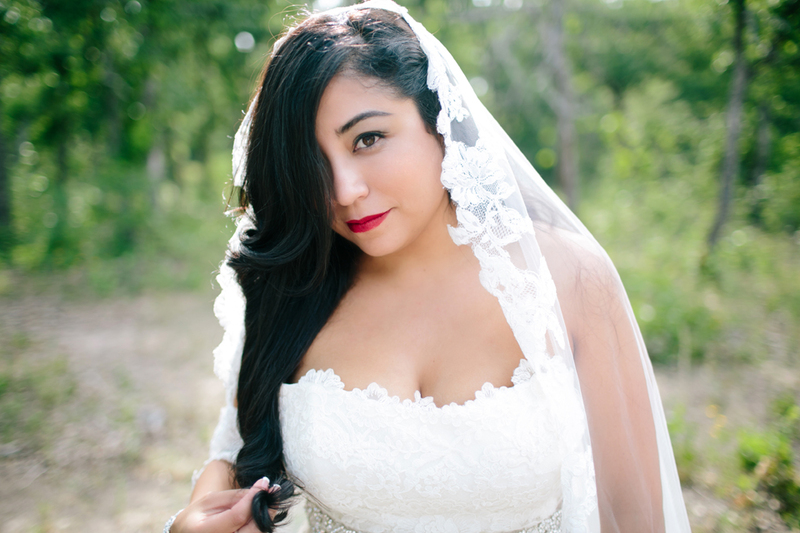 Long, thick hair curled together at the ends allows hair to be the perfect canvas for a headpiece like this mantilla veil. This french braid is constructed with lots of volume for a style that mixes classical appeal with modern touches. A perfectly pulled together look for perfectionist brides, this style features centre parted hair that frames the face, while a high bouffant is held in place with a slim headband. Pair this style with a satin ballgown to fulfill your Cinderella fantasies. The perfect marriage between letting your long locks flow or pinning them all up, this half up style is fancy, modern, and easy to wear all day and night. A new twist on an old style, long hair is pulled up into a beehive that keeps long hair up while not being as defined as a bun. Accessorize with any type of headband to pull this look together. Showing off your long locks in the most romantic way, this style is the perfect accompaniment for a lace gown, and gives you the option to embellish with a hairpiece, headband, or long, intricate veil. 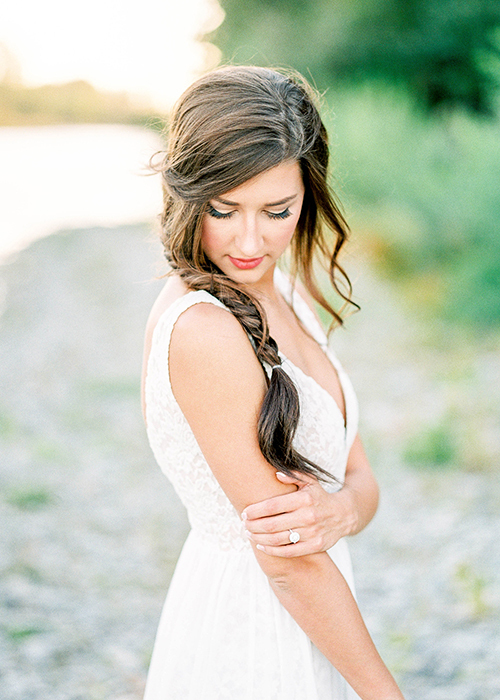 This romantic fishtail braid is styled with softness, so that hair doesn’t look stiff and full of product. 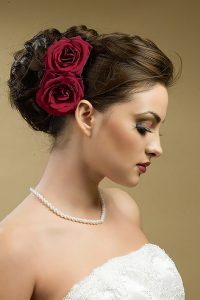 Perfect for a low maintenance bride who wants to look delicate but not too done up on on her big day.